Down an alleyway marked by a distinctive sign on Fleet Street, Ye Olde Cheshire Cheese is another good Sam Smiths pub with another good story. The pub was one of the first to be rebuilt after the Great Fire of London and is recorded as existing on this site for more than 100 years before, and even earlier as a guest house belonging to a nearby Carmelite Monastery. Indeed, the pub was famously referred to in Charles Dickens's A Tale of Two Cities. Legendary regulars include Oliver Goldsmith, Sir Arthur Conan Doyle, Alfred Tennyson and Mark Twain, as well as Dr. Samuel Johnson whose quote gave this site its title. It is also another listed in CAMRA's Regional Inventory for London, Pub Interiors of Special Historic Interest, which is generally a yardstick of interesting pubs. Inside, the lack of natural light only adds to the experience and dulls the senses to make Samuel Smith's brews taste as best they can. It certainly has a charm and is a Central London pub with less crowds and more authenticity than most. Its so authentic your author even swears there was sawdust on the ground at the last visit to absorb spit and spillages. 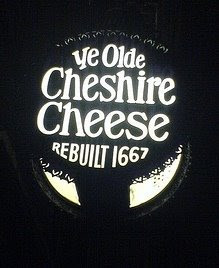 For more information visit the page on Wikipedia at http://en.wikipedia.org/wiki/Ye_Olde_Cheshire_Cheese.